Bluefin tuna have been infrequent visitors to our waters for many years in the same way as Gilthead Bream. Only one diver has managed to spear one but several have seen one. The current British Record is 36 pounds and thought these fish grow to over 1000lbs we do not anticipate the record being broken anytime soon. Though commercially vulnerable the capture of one or two bluefin by spearfishermen is sustainable. It has only been achieved once in British history! Numerous sightings off Portland including three sightings off the outer breakwater including Brett’s fish. Several were accidentally caught in nets and one of 80lbs was caught by a bass fishing boat in Portland Race. The South Coast of Ireland has had its share of Tuna caught by anglers, as has Scarborough in the past. In accordance with other tuna, Bluefins are fast moving and voracious, smashing mackerel and then moving on, never pausing or holding up. This makes them a very challenging species to fish for. 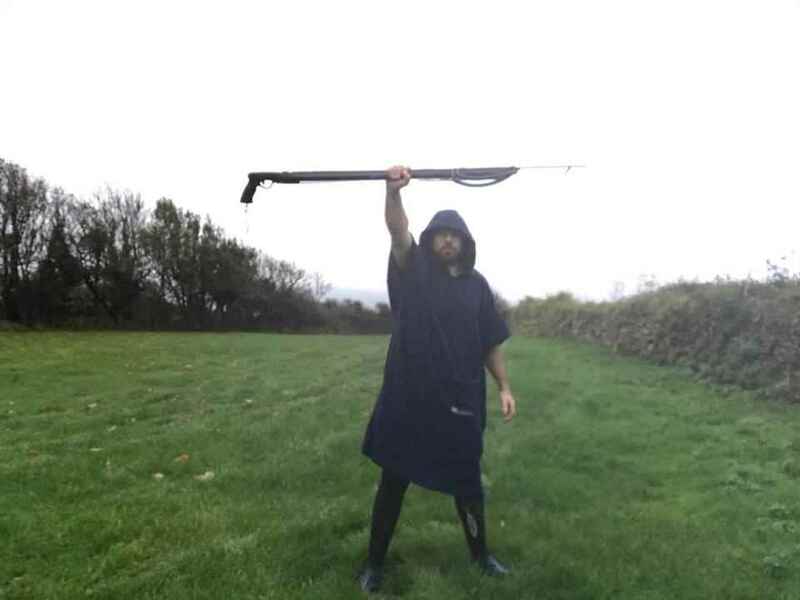 Attempts to attract them with chumming mackerel both off Ireland and Portland were a dismal failure with no sightings. 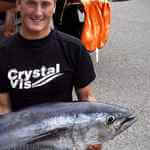 Brett’s fish was caught in open water in bad vis on the way to the bottom in only 16m off Portland Breakwater! (Please note spearfishing is not allowed within 100m of the breakwater). These fish are the veritable needle in the haystack so efforts to specifically catch them are unlikely to succeed. The most important things are quick reflexes and a gun which is tied to your floatline. We would not advise specifically fishing for these fish- the odds are long indeed. Brett had an amusing 5 minutes of infamy in the Sun for his misdeeds! They have been included as an example of what can be out there and to keep an open mind! 100cm Rob Allen Carbon with double 16mm rubbers and 7.5mm spear connected direct to floatline.